Anyone seeing the trailer for The Place Beyond the Pines would be forgiven for assuming it’s the standard high-minded crime drama. The reality is, like many things about the film, a bit less conventional. There is some larceny and a bit of violence, but all in service of an ambitious if slightly uneven tale of responsibility and paternal legacy as defined by the moral choices of three men and the resulting consequences. I should warn you that while I'm going to try to dance around major spoilers for the plot, this might be the kind of film best seen with zero prior information going in. One of those men is Luke Glanton (Ryan Gosling), a stunt rider for a traveling carnival with seemingly no ties to anyone until he bumps into Romina (Eva Mendes), an acquaintance from his last visit through town, and discovers that their fling has led to the birth of a son, Jason. Despite Romina’s insistence that she doesn’t expect anything from him, content to raise the baby with her new boyfriend, Glanton becomes possessed by a newfound sense of responsibility. To support what he now considers to be his family, he turns to staging elaborate bank robberies, using his riding skills to make quick getaways. 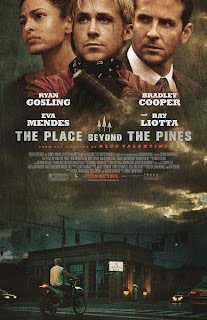 About forty minutes into the film, the narrative is suddenly passed to Avery Cross (Bradley Cooper), a rookie beat cop who becomes a public hero following a shoot-out that leaves him conflicted and traumatized. As the suppressed guilt from the experience affects his relationship with his infant son and threatens to limit his career advancement, he is confronted by widespread corruption in his department and must decide whether to take action. The third act skips ahead many years and lets us see the repercussions of both men's actions, as the now teenage Jason (Dane DeHaan) and Cross' troubled son A.J. (Emory Cohen) are forced to deal with the fall-out from their fathers' decisions. Viewed together, the various plot threads offer an interesting take on a skewed, masculine conception of responsibility and how guilt drives each character to take on perceived obligations. Director Derek Cianfrance's previous feature was Blue Valentine, also featuring Ryan Gosling, which I've missed to this point but am now eager to see considering his work here. There is a considerable confidence in the way Cianfrance is willing to shake up the narrative, shifting point-of-view and timeframe, and making stylish visual choices that never seem to be without purpose. Consider the opening shot, a long take following behind Glanton as he moves through the carnival grounds, preparing himself for his act, never interacting with anyone around him. Instantly we sense the character's social isolation and single-mindedness. There's also a gripping police chase that's refreshingly no-frills, photographed less like your standard action scene and more like footage from the evening news as we watch Glanton pursued through a cemetery from inside a police car. Meanwhile, musician Mike Patton provides an ethereal, often ominous score to the proceedings that’s one of my favorites so far this year. Given the stoic façade he initially presents, it seems at first that Gosling is merely repeating his role from Driver, presenting us with another cool-headed criminal in a slick jacket. But this time he shows us that beneath the seemingly taciturn exterior is deep-seated sadness and disappointment, emotions it seems Glanton has never had occasion to reflect on. His desire to give his son the life he feels he was cheated seems noble until it turns to outright obsession and violence. Cross’ story initially is disorienting in that while there are narrative connections to Glanton's plotline, it seems for a time there's less of a thematic tie-in as we focus more on his dealings with dirty cops and less on his relationship with his wife and son. But all of Cross' actions reflect on Glanton's, as Cross acts to right what he considers a wrong only to have his efforts rejected and to neglect his own son in the process. Like Glanton, Cross buries his turmoil deep, but where Glanton is socially isolated, Cross is surrounded by others and seems under constant pressure to maintain his affable, grounded exterior. Cooper conveys all this beautifully, proving his excellent performance in Silver Linings Playbook was no fluke. Completing the trifecta of troubled men is DeHaan. Following his breakout role in Chronicle and being cast as Harry Osborn in the next installment of the Spider-man reboot, he seems to be the go-to guy for troubled teen roles and it's not hard to see why. He matches the intensity of his costars, suggesting Jason's quiet, awkward demeanor masks a storm of conflict and confusion as revelations about his father drive him to take action. Make no mistake, he is an actor to watch out for. Two supporting roles of note are Mahershala Ali as Kofi, Romina's patient boyfriend. His situation, particularly his relationship with Jason, make us wish we could have seen more from his point of view. The other is Ben Mendelsohn, nearly unrecognizable from his role as a corporate baddie in The Dark Knight Rises, as Glanton's grungy but refreshingly sensible partner-in-crime. Unfortunately, with a film so focused on masculine attitudes, the female roles do suffer. Mendes and Rose Byrne as Cross' wife are great but their characters, particularly Byrne's, are left shortchanged. It's also worth considering the title itself. While it is the literal meaning of Schenectady, New York, where the film is set, it's not a coincidence that pivotal meetings and confrontations in each of the three men's lives take place among the woods. The title suggests an imagined place where they can get past those incidents, that somehow through their often misguided actions, these characters can stop the cycle they are participants in, even as the film grimly hints that the pattern may continue.